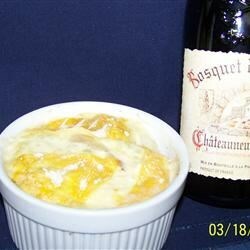 "A potato casserole that is a favorite in France. It's a specialty from the Savoie (Alps) region. Perfect for a cold day--especially after a day on the slopes. I use Brie when making it in the U.S. Reblochon cheese is the authentic cheese for the dish, but it's impossible to find in the USA. Raclette cheese mixed with Gruyere is also a good substitute." Preheat an oven to 350 degrees F (175 degrees C). Grease a 9x13-inch baking pan. Place the potatoes into a large pot and cover with salted water. Bring to a boil over high heat, then reduce heat to medium-low, cover, and simmer until tender, 10 to 12 minutes. Drain and allow to steam dry for a minute or two, then place in a large bowl. Heat the butter in a skillet over medium heat. Stir in the onion; cook and stir until the onion has softened and turned translucent, about 5 minutes. Stir in the bacon, and continue cooking and stirring until the bacon is browned and beginning to crisp, 2 to 3 more minutes. Mix onion mixture into the potatoes. Stir in the creme fraiche and season with salt and pepper. Spread potato mixture into the prepared baking dish, and arrange the sliced Brie cheese on top. Cover with aluminum foil. Bake in the preheated oven for 30 minutes, then remove the aluminum foil. Return the pan to the oven, and continue baking until bubbly, 10 to 15 more minutes. The greatest, cheesiest potato casserole of all time! The way I determine exactly how many potatoes I'm using is by seeing how many fill a 9x13-inch pan. It's usually about half of a 5 pound bag. The amount of cheese will seem like a lot. It melts down into the potatoes - if you don't use enough, the dish will come out too dry. I made this dish often last year when I lived in France, and it is one that can easily be "winged" and is difficult to mess up. I knocked my own socks off with this one, thank you!